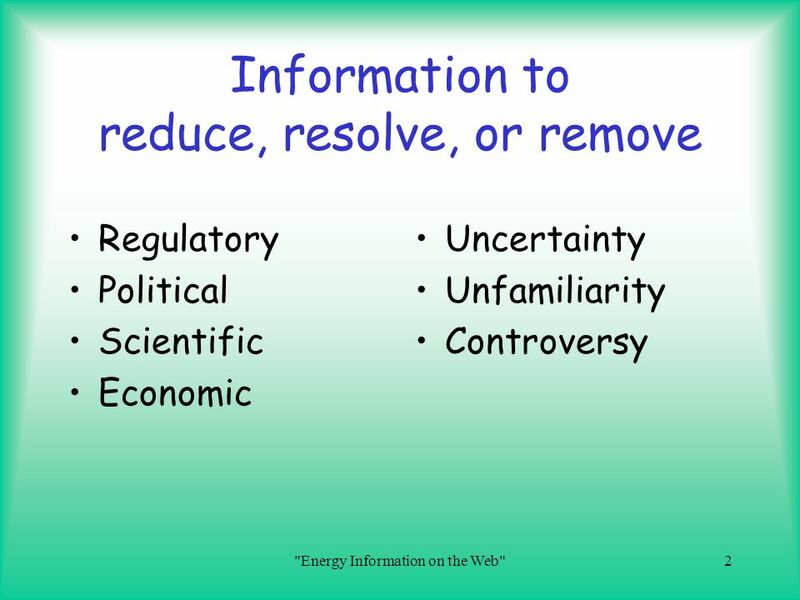 Regulatory Political Scientific Economic Uncertainty Unfamiliarity Controversy "Energy Information on the Web"
3 "Energy Information on the Web"
“You don’t need to take a course. 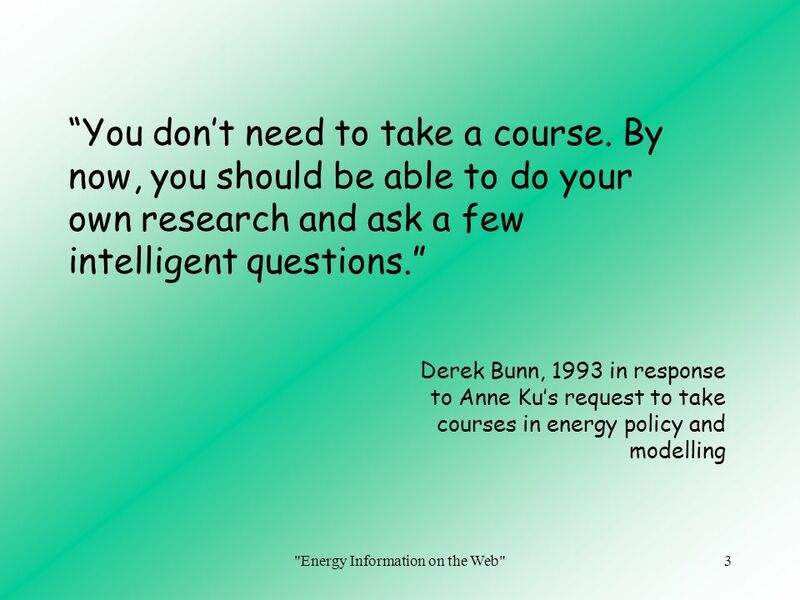 By now, you should be able to do your own research and ask a few intelligent questions.” Derek Bunn, 1993 in response to Anne Ku’s request to take courses in energy policy and modelling "Energy Information on the Web"
4 Lo and behold the Internet ! 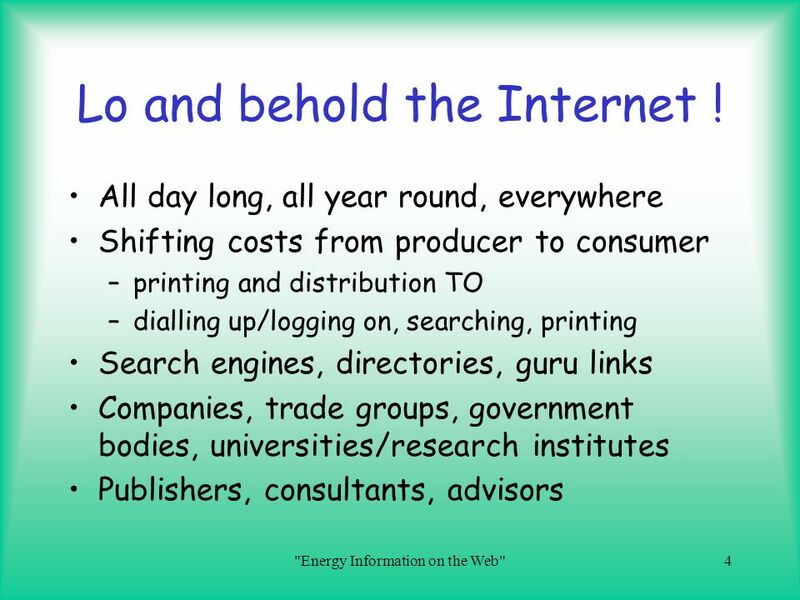 All day long, all year round, everywhere Shifting costs from producer to consumer printing and distribution TO dialling up/logging on, searching, printing Search engines, directories, guru links Companies, trade groups, government bodies, universities/research institutes Publishers, consultants, advisors "Energy Information on the Web"
5 Finders keepers. Losers weepers. 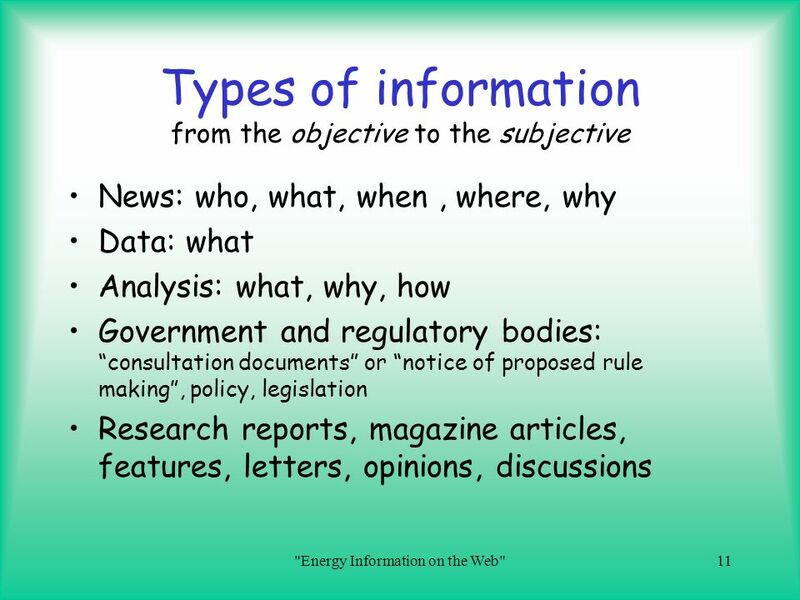 Information is costly to produce but cheap to reproduce." 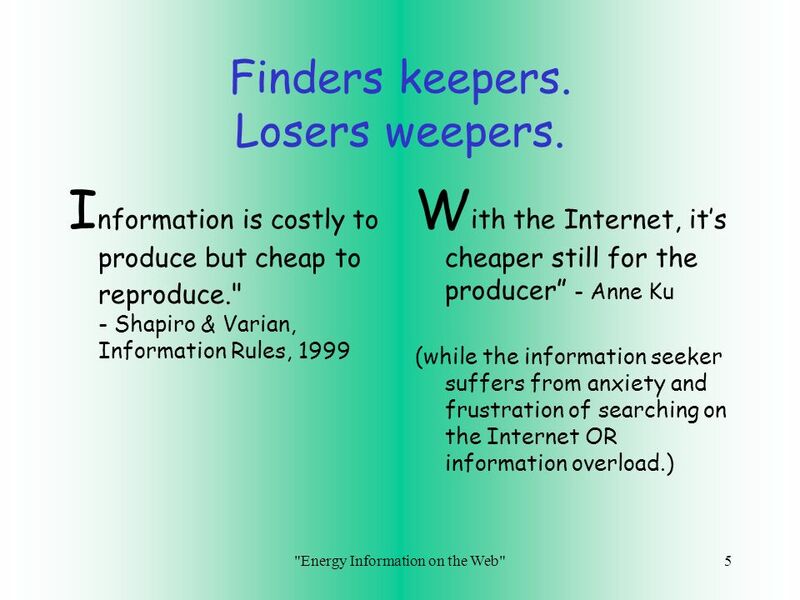 - Shapiro & Varian, Information Rules, 1999 With the Internet, it’s cheaper still for the producer” - Anne Ku (while the information seeker suffers from anxiety and frustration of searching on the Internet OR information overload.) 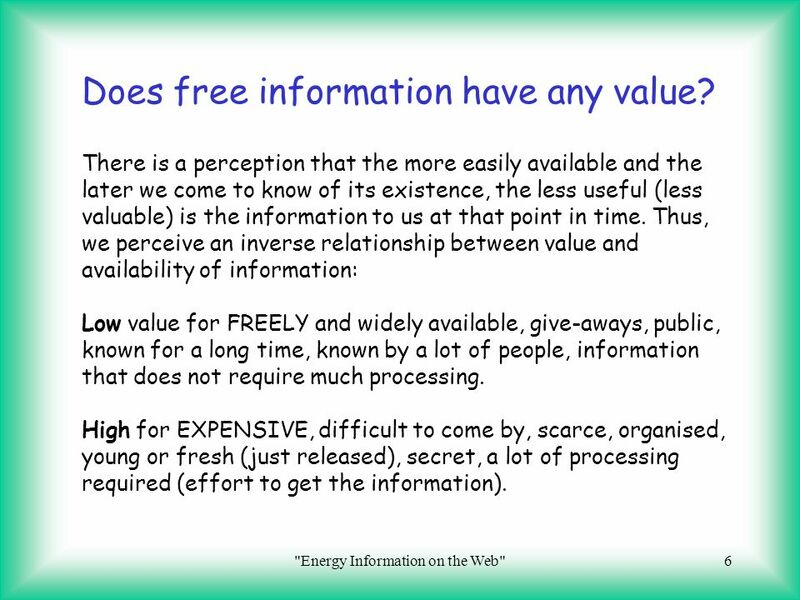 "Energy Information on the Web"
6 "Energy Information on the Web"
Does free information have any value? 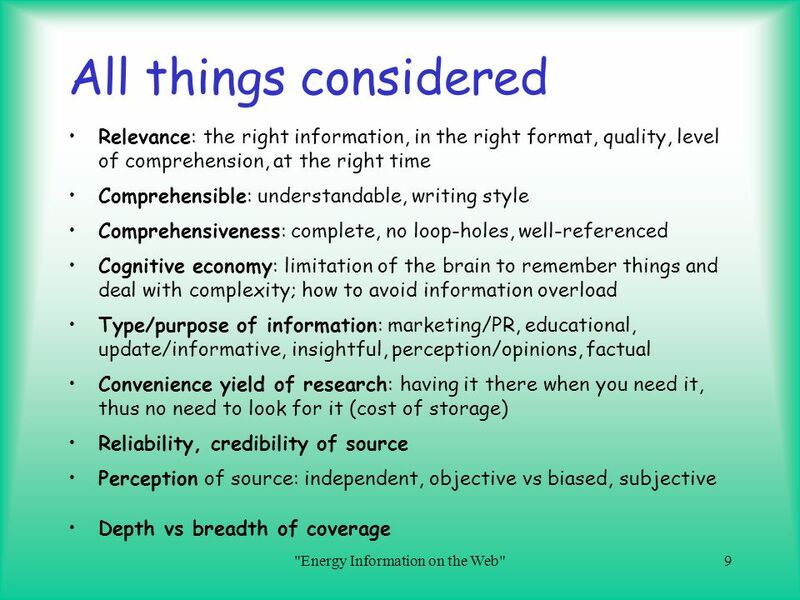 There is a perception that the more easily available and the later we come to know of its existence, the less useful (less valuable) is the information to us at that point in time. 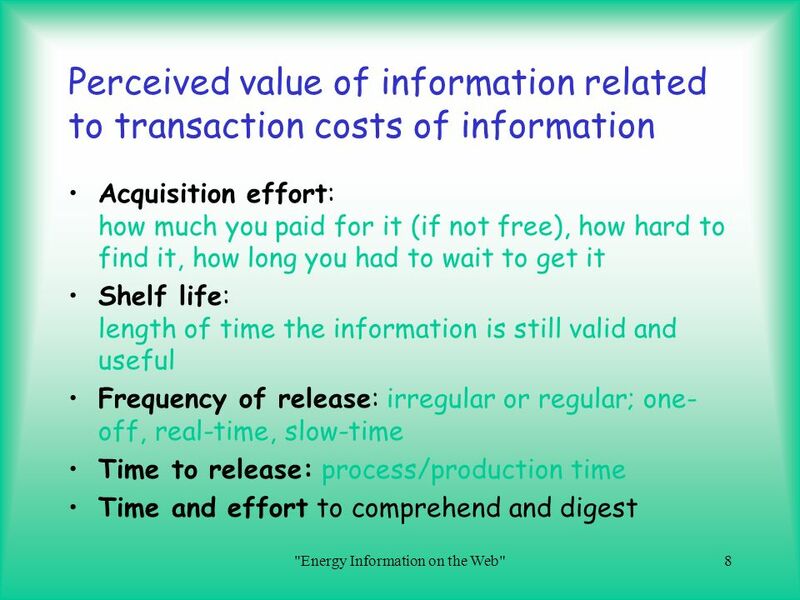 Thus, we perceive an inverse relationship between value and availability of information: Low value for FREELY and widely available, give-aways, public, known for a long time, known by a lot of people, information that does not require much processing. 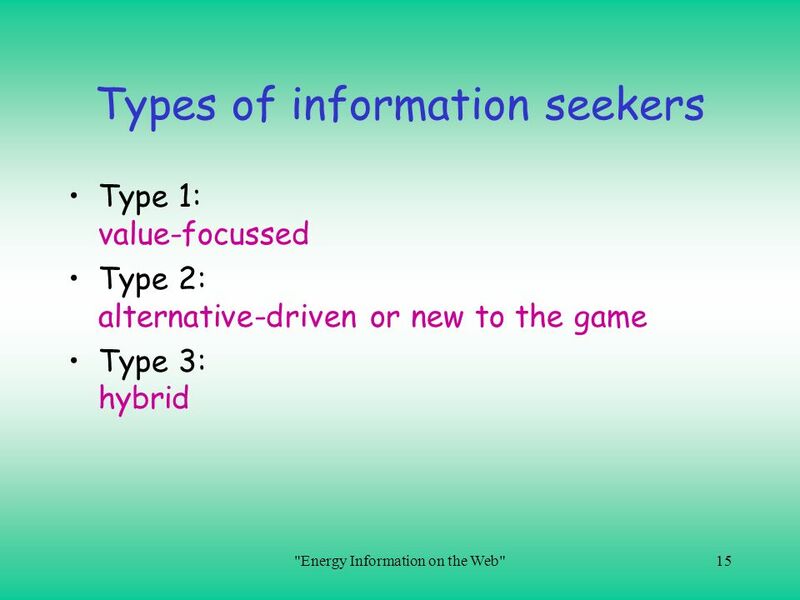 High for EXPENSIVE, difficult to come by, scarce, organised, young or fresh (just released), secret, a lot of processing required (effort to get the information). 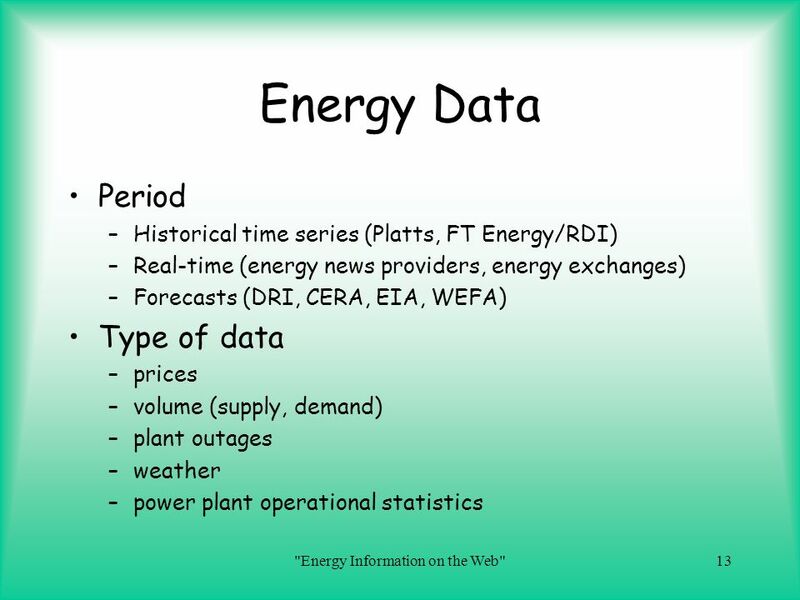 "Energy Information on the Web"
7 Why would information be provided free of charge? 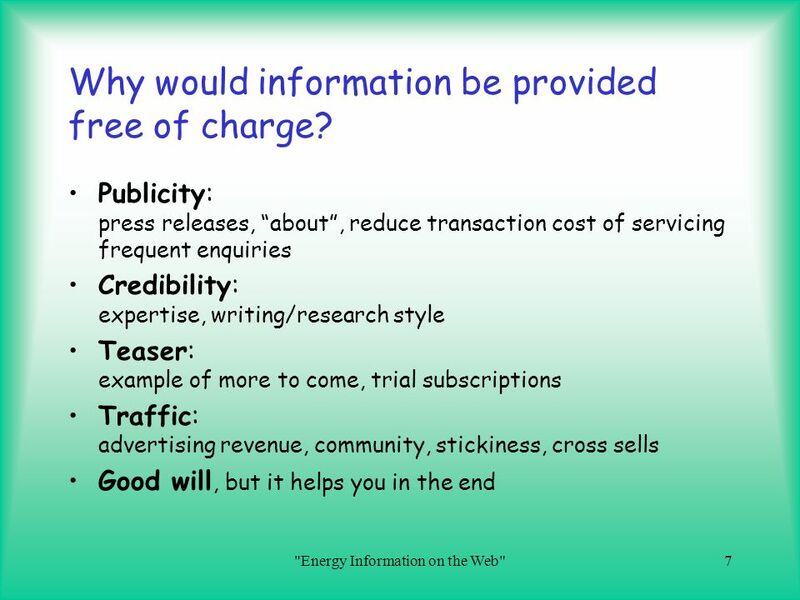 Publicity: press releases, “about”, reduce transaction cost of servicing frequent enquiries Credibility: expertise, writing/research style Teaser: example of more to come, trial subscriptions Traffic: advertising revenue, community, stickiness, cross sells Good will, but it helps you in the end "Energy Information on the Web"
8 "Energy Information on the Web"
Perceived value of information related to transaction costs of information Acquisition effort: how much you paid for it (if not free), how hard to find it, how long you had to wait to get it Shelf life: length of time the information is still valid and useful Frequency of release: irregular or regular; one-off, real-time, slow-time Time to release: process/production time Time and effort to comprehend and digest "Energy Information on the Web"
9 "Energy Information on the Web"
All things considered Relevance: the right information, in the right format, quality, level of comprehension, at the right time Comprehensible: understandable, writing style Comprehensiveness: complete, no loop-holes, well-referenced Cognitive economy: limitation of the brain to remember things and deal with complexity; how to avoid information overload Type/purpose of information: marketing/PR, educational, update/informative, insightful, perception/opinions, factual Convenience yield of research: having it there when you need it, thus no need to look for it (cost of storage) Reliability, credibility of source Perception of source: independent, objective vs biased, subjective Depth vs breadth of coverage "Energy Information on the Web"
"Energy Information on the Web"
News: who, what, when , where, why Data: what Analysis: what, why, how Government and regulatory bodies: “consultation documents” or “notice of proposed rule making”, policy, legislation Research reports, magazine articles, features, letters, opinions, discussions "Energy Information on the Web"
12 "Energy Information on the Web"
Energy News Specialist energy only Platts, Sagewave Reuters Energy Briefing Petroleum Argus Dow Jones Energy FT Energy Multi-sourced Energy Central Energy Online Generalist news provider with news about energy New York Times Wallstreet Journal Financial Times CNN BBC "Energy Information on the Web"
13 "Energy Information on the Web"
Energy Data Period Historical time series (Platts, FT Energy/RDI) Real-time (energy news providers, energy exchanges) Forecasts (DRI, CERA, EIA, WEFA) Type of data prices volume (supply, demand) plant outages weather power plant operational statistics "Energy Information on the Web"
14 "Energy Information on the Web"
Energy Analysis Publications: daily, weekly, fortnightly, monthly, bi-monthly, quarterly Utilities Week, Public Utilities Fortnightly, EPRM, Hart Energy Markets, Global Energy Business, Commodities Now Consultants: individuals such as Stoft, energy specialists such as Scientech, the big ones all have energy/utilities practices Universities: Univ of California, Stanford, Harvard, LBS Trade/professional associations, lobby groups: EEI, EA, IAEE, EurElectric, EFET, WRMA, BWEA, TURN Government: EIA, OFGEM, CEC, FERC "Energy Information on the Web"
Type 1: value-focussed Type 2: alternative-driven or new to the game Type 3: hybrid "Energy Information on the Web"
Knowledgeable, specific No time to scan or window-shop Willing to pay Convenience yield of research very high: have the information available when you need it Examples: researchers, consultants, speakers Solutions: effective search engines, search strategy, clipping service, paid subscriptions, "Energy Information on the Web"
Like to browse and surf Learning mode, window shopping Examples: Newcomers to energy, magazine editors looking for good ideas Solutions: “push media” such as newsedge or pointcast, subscriptions, click-through links, guru sites. 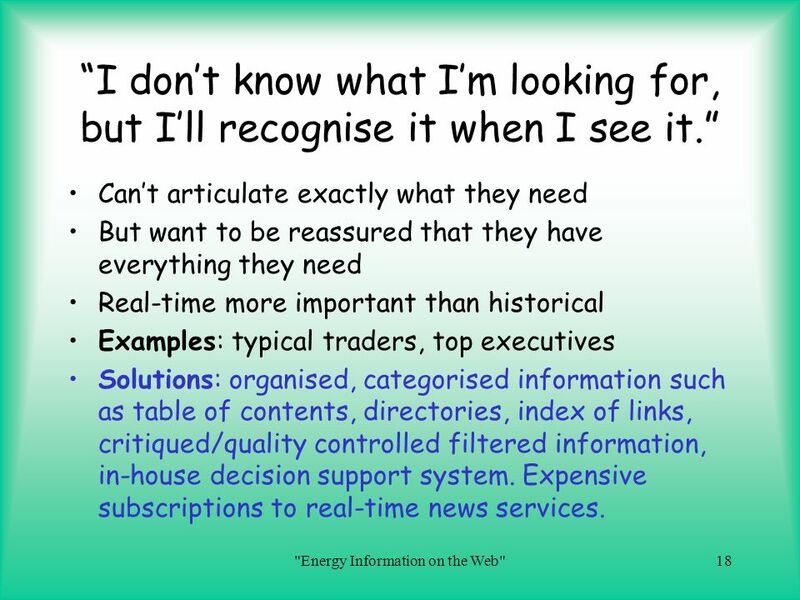 "Energy Information on the Web"
18 "Energy Information on the Web"
“I don’t know what I’m looking for, but I’ll recognise it when I see it.” Can’t articulate exactly what they need But want to be reassured that they have everything they need Real-time more important than historical Examples: typical traders, top executives Solutions: organised, categorised information such as table of contents, directories, index of links, critiqued/quality controlled filtered information, in-house decision support system. 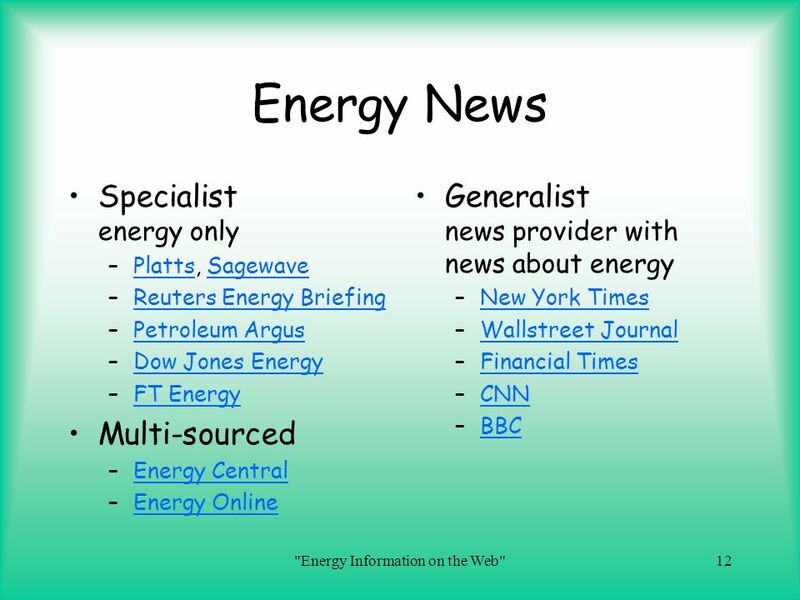 Expensive subscriptions to real-time news services. 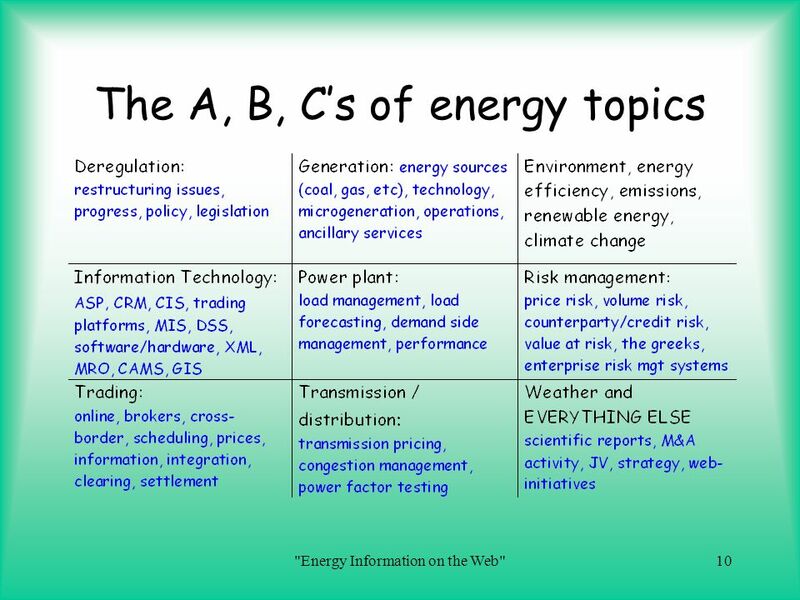 "Energy Information on the Web"
Search engines keywords and boolean logic meta-search engines: Google, Metacrawler, Dogpile specific: EnergySearch Energy portals: EyeForEnergy, Energy Central Guru links: Utility Connection, EIA energy links "Energy Information on the Web"
20 "Energy Information on the Web"
Don’t forget to use the Pareto Rule: 20% of information sources provide 80% of what you need. 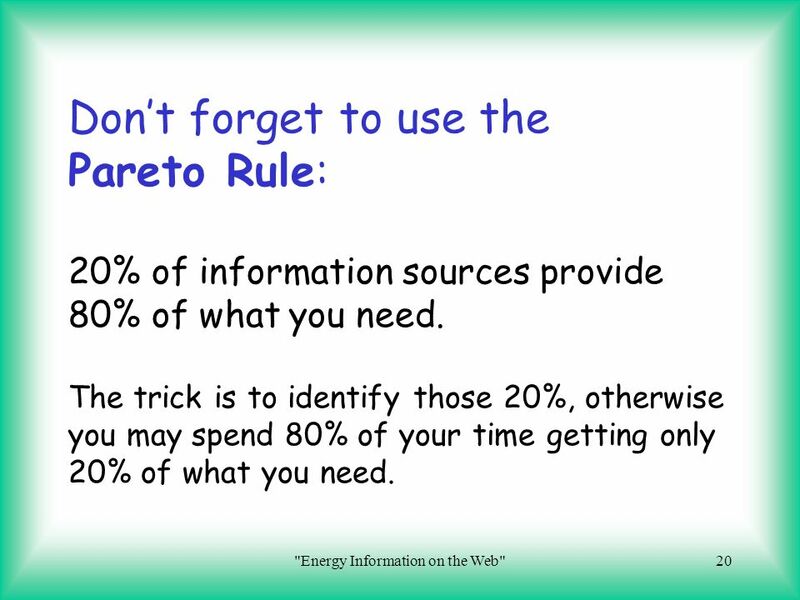 The trick is to identify those 20%, otherwise you may spend 80% of your time getting only 20% of what you need. 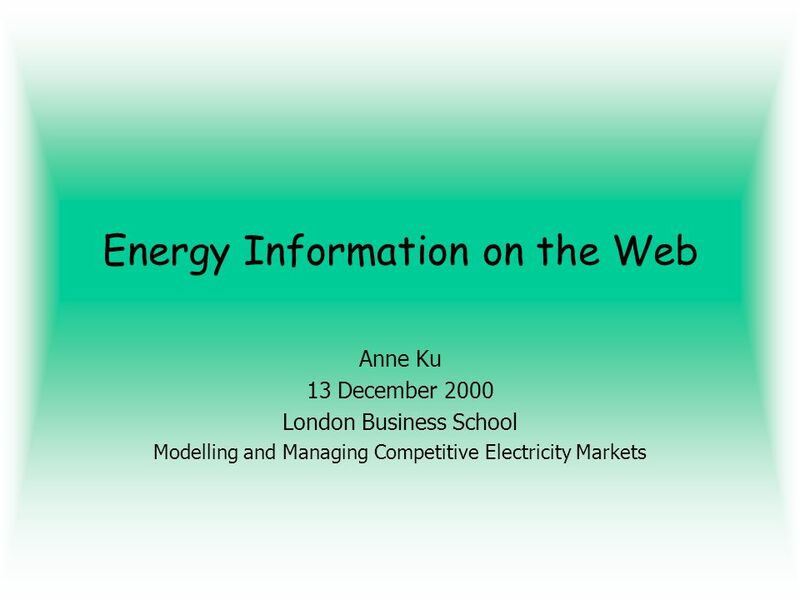 "Energy Information on the Web"
21 "Energy Information on the Web"
tel: (020) Forthcoming article: Energy Information on the Web in January/February 2001 issue of Global Energy Business, to appear at "Energy Information on the Web"
Download ppt "Energy Information on the Web"
Slide 1 of 10 Taming the Internet. 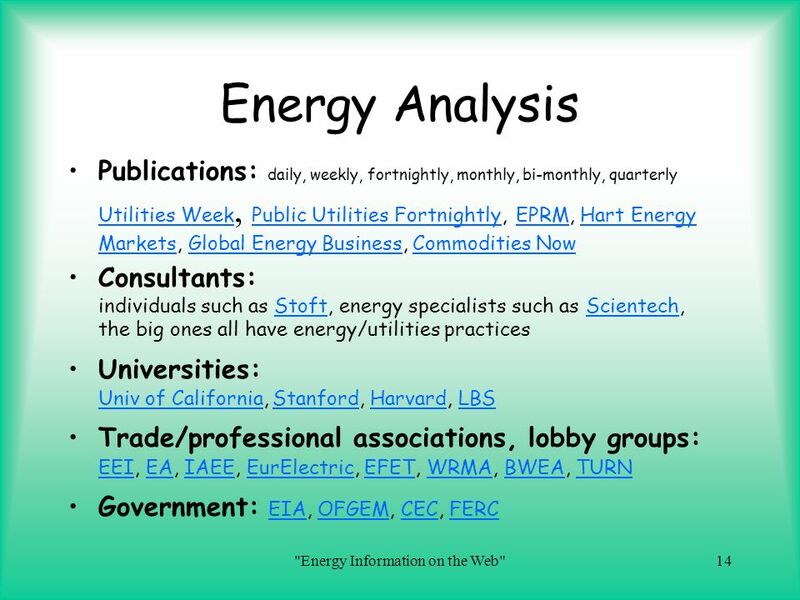 Slide 2 of 10 Overview Specific products include Directories, Intellectual Capital Collections, and annotated reports. 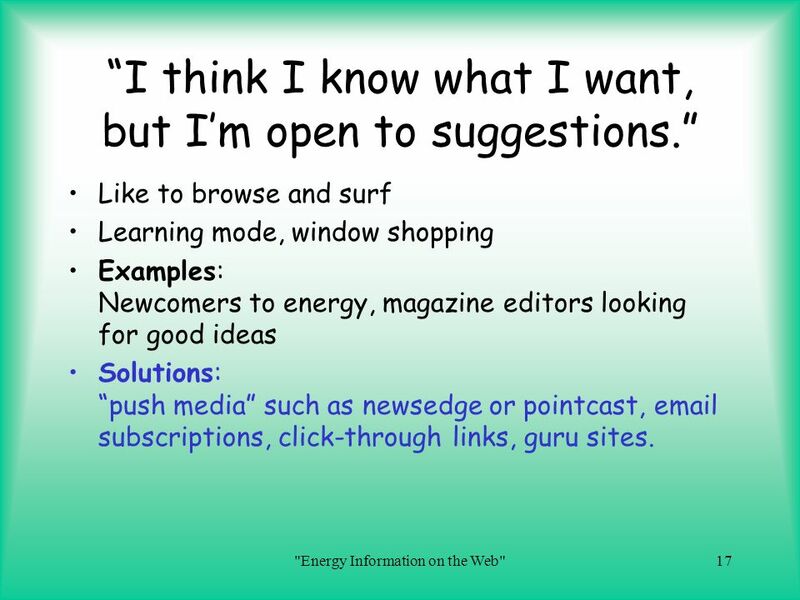 Access Part I Accessing Health Information Through the Internet. 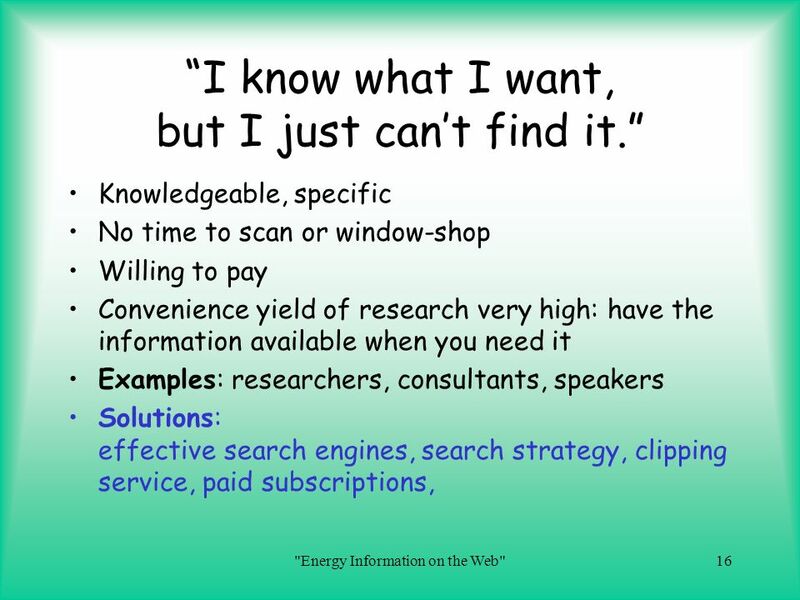 1 How To Research and Invest Online Investing Online The internet allows investors to access account information 24/7, initiate securities transactions. 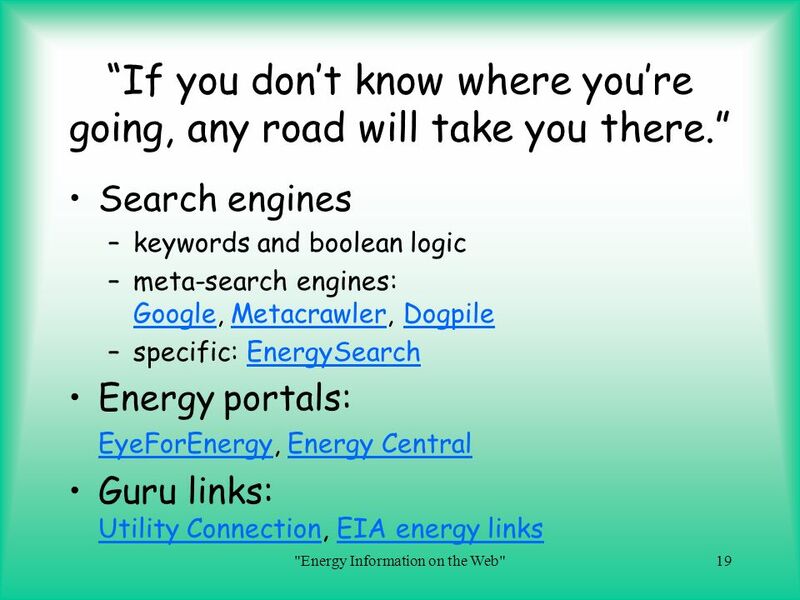 Mark Levene, An Introduction to Search Engines and Web Navigation © Pearson Education Limited 2005 Slide 4.1 Chapter 4 : Searching the Web The mechanics. 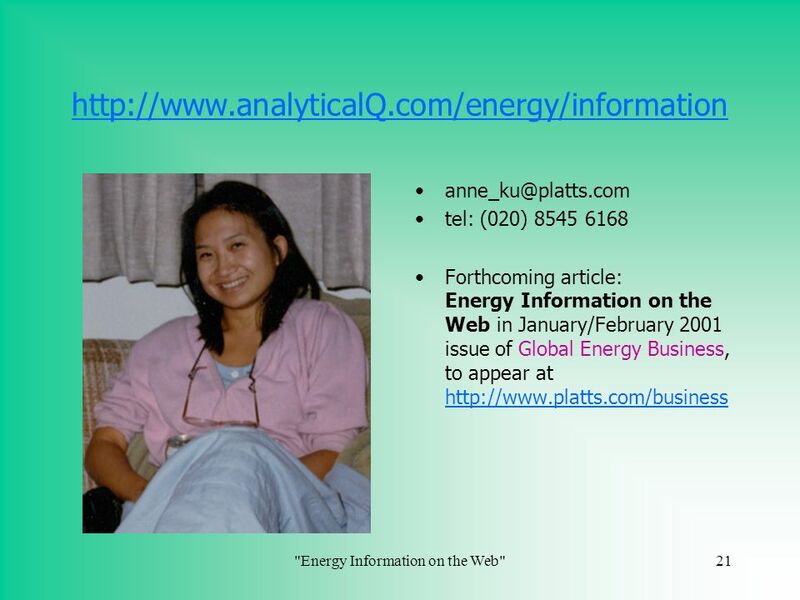 Tel Marketing and Profile-raising through blogging Christine Goodair, BA MCLIP CIG Workshop 8 th June 2007.